If you're not sure about grey as a colour option for your home, now's the time to reconsider! Grey gloss is such a calming and versatile colour; it's great for adding a warm and welcoming touch to your home, while still remaining sleek, stylish and modern. 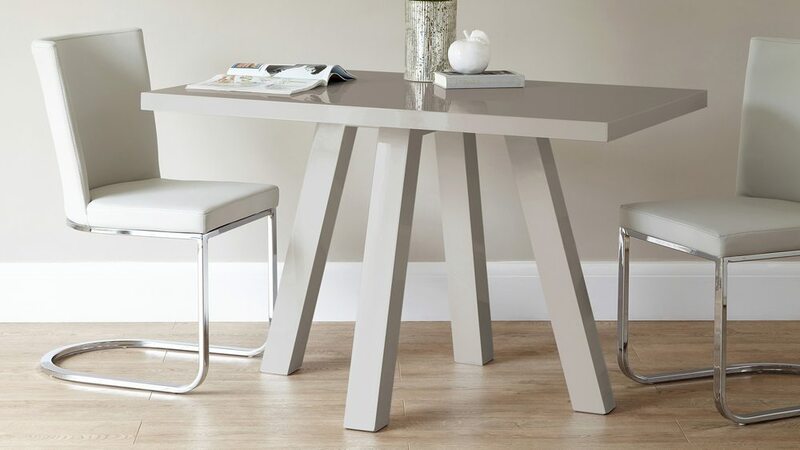 This is why we've chosen grey gloss as a colour option for our luxurious Cross 4 Seater Table. Exclusive to Danetti the Cross 4 seater dining table will create a welcoming and highly social area. What better way to share the days events than around a stylish dining table! 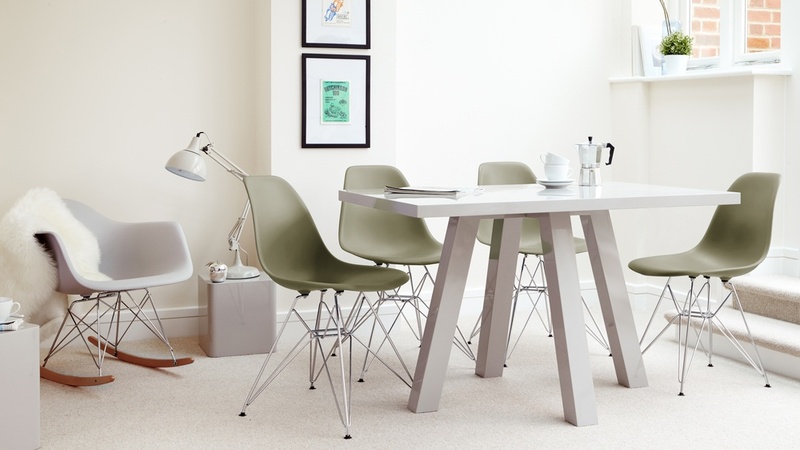 The frame of this Cross 4 Seater Grey Gloss Dining Table actually crosses under the table top. 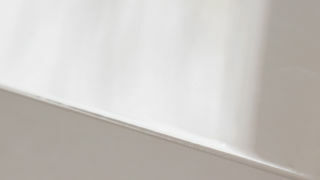 This subtle yet effective feature keeps the design of the table very simple, but in a stylised way. By adding the under frame, we've included an extra bit of design with lots of added stability. 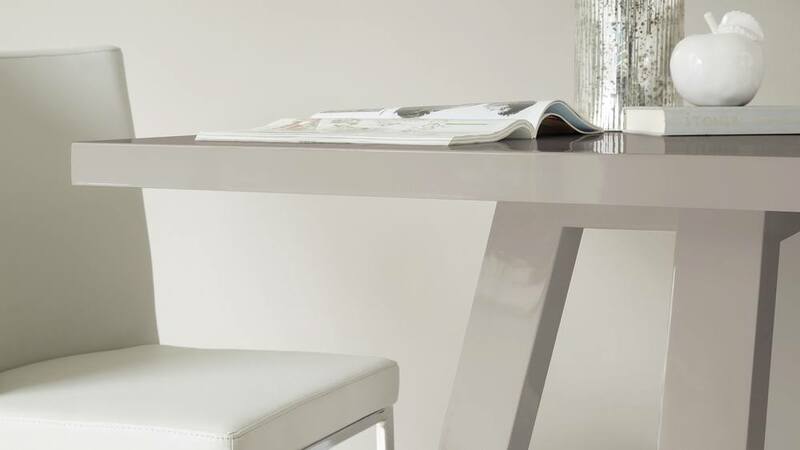 With similar qualities to that of a pedestal base, the frame allows for space around and under the table. You could comfortably sit guests two by two or one on each edge without the table legs getting in the way. This makes the table very versatile, both with where you can place it in a space and how many guests you choose to seat. We use a high grade of MDF for this range of dining tables as part of our brand commitment to always providing products that are as safe as they are beautiful. This is so you can always buy our products with absolute security and confidence. 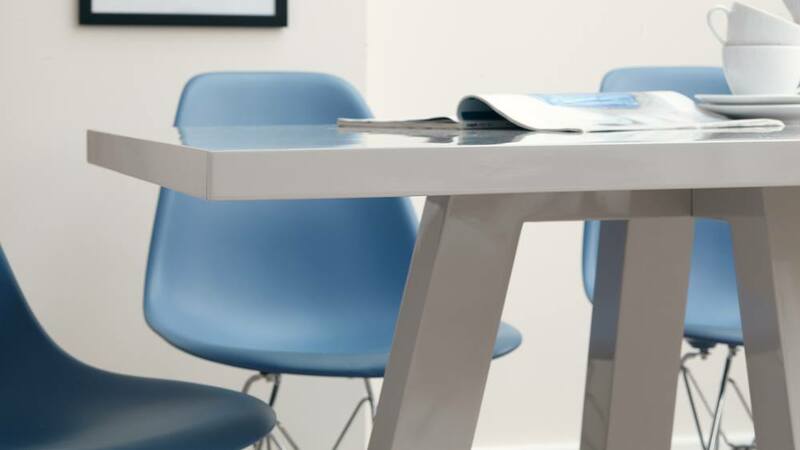 Our designers love the grey gloss finish on our existing products and thought it was the perfect colour to add a really modern look to the Cross table. Grey gloss is a great style choice as it has all the qualities of white gloss, being wipeable, durable and reflective, but in a softer, on trend tone. The layers of gloss are applied in three coats and are dried for 24 hours each to ensure a hard finish that is highly reflective. The table is then polished by hand. All of this attention to detail is to ensure the gloss has a hard finish that is highly reflective, durable and keeps i's shine for longer. This Cross 4 Seater Grey Gloss Dining Table is ideal for family mealtimes. It's great for placing all the snacks for the buffet or as stylish spot for a quiet dinner for two. If you like look but would prefer a round table check out the Arc 4 Seater Grey Gloss and Oak Dining Table, or how about the larger Zen 6 Seater Oak Dining Table.